Situated 290 km from Johannesburg on the Waterval Boven, Rocky Drift Private Nature Reserve. This fine establishment embraces an enclosed valley of approximately 257 hectares and some of the most beautiful mountain country to be found in the Waterval Boven district. 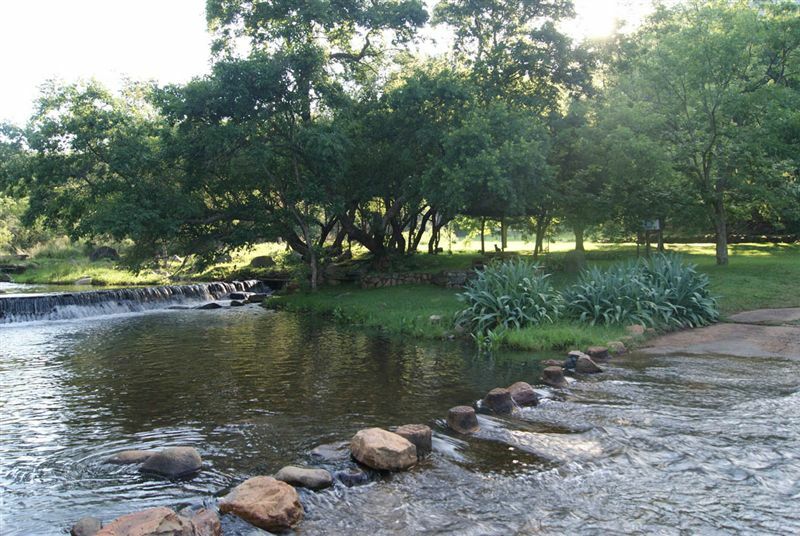 The climate is typical of summer rainfall areas with winter and summer mean temperatures of between six degrees in winter and 34 degrees in summer to be expected.<br /><br />Nourished by the Joubert spruit tributary of the Elands river, the natural water supply is fountain fed from the mountain tops and of the highest quality. At no stage during the past 60 years has the stream ever dried up. The Nature Reserve is ecologically contained and home to many species of fauna such as bush buck, baboon, klipspringer, duiker, steenbok, vaal reed buck, vervet monkeys, leopard, genet, rooikat and rock pythons to name a few. There is also an abundance of bird life, including black eagle, steppe buzzard as well as various kites and falcons.<br /><br />Rich in natural and South African history, the kloof and slopes of the valley once housed President Paul Kruger&apos;s commandos during the period of his escape to exile via Lourenco Marques, now Maputo. Circular rock encampments with old Martini Henry rifle shells and enamel mugs used by the Boer soldiers and Scouts are sometimes unearthed on the property. "Lovely farm but accommodation substandard"
"Advertised as a private nature reserve but they have peacocks at the accommodation disturbing the peace. Advertised as pet friendly but a very badly socialized and dog aggressive Rottweiler nearly attacked my dog. Accommodation needs TLC and caretakers willingness to help needs improvement." "lovely place to stay... but very unpleasant reception of guests. We didn&apos;t even get to meet the owners, we got the keys from the worker there. we had no guidance regarding the activities stated on the website. All you get is a flip file with vague information and phone numbers which are not even answered. Improvement is NEEDED on the reception of guests." "The only downfall is that you cannot take your trailer to your front door. Judas also complained about us taking wood on the second night saying that it&apos;s hard to find and he has to get it with a wheel barrow." "We have been to Rockydrift a number of time and each time we&apos;ve come back feeling rested. It&apos;s such a beautiful and peaceful place. Our kids have a blast there and we get to rest." "Very beautiful view of the river front and lawn area. Very relaxing atmosphere. The unit itself needs some attention. The chairs are uncomfortable, cushions are ripped, old magazines that is not relevant, wooden cabinet without glass doors, dstv remote not working properly, random decorations, broken blinds, fan in room is not working, loft without a bed, shower head that is not working properly. The kitchen is extremely nice but leaves much to ask for of the remainder of the unit. At the back of the unit, there is a lot excess building material and it almost looks like a junk yard. It would have been a lot better if the front was fenced off so that the dogs can roam freely on the lawn without escaping into the mountains. Also, it would have been helpful if there was a map of some sort to point out the walking trails. The place has a lot of potential. The workers are also very friendly and helpful." "We had a wonderful time. Judas and Leno are so helpful. Witvoed the local dog is such a nice dog. Our dog made friends with him and she (Mandy) and the four of us had a really good rest. We will be back." "Absolutely love this place. So peaceful and relaxing. Always leave feeling rejuvenated!" "rained most of the time, but peaceful and quiet"
"We have been here more than once and will come again. Love the fact that you can have the whole valley to yourself. It&apos;s so peaceful and the walk to the rock pools is fantastic. My kids love it here, as do my whole family. A favourite getaway of ours." "The place is stunning, there are a few things that maybe should be reported. The sliding door kept coming off the rails. Please replace the opener it does not work."